To stake or not to stake, that indeed is the question. Once upon a time everyone carefully staked every tree when it was planted, but today the experts tell us that often it is not necessary, or even desirable. 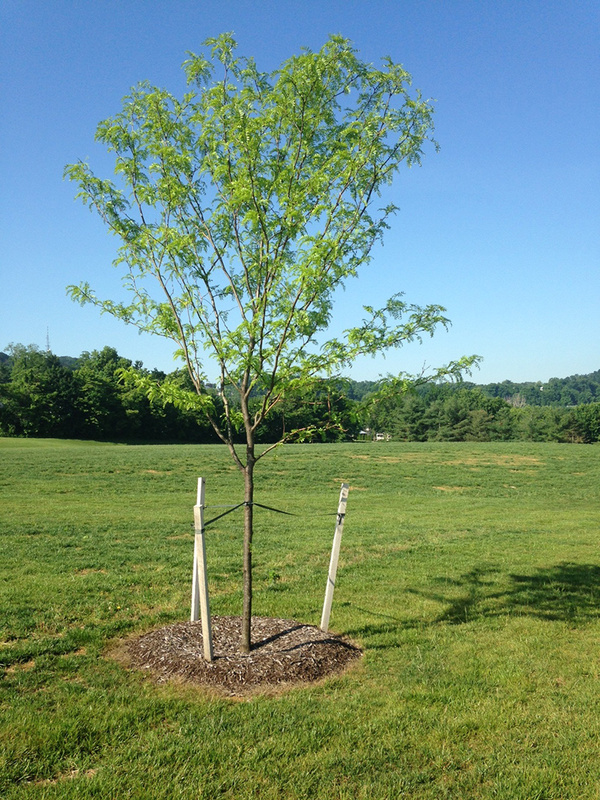 Although staking can seem like a good idea, it can cause future problems for your tree. Sometimes it is needed and there are some ‘ and don’ts’ when it comes to staking that can make all the difference to the success of your tree planting. Most people think that a stake is needed to keep a tree upright and protect it from breaking in the wind, but this is not true. A healthy tree will always keep itself upright and in fact, if the lower part is held rigidly by a stake there is more, not less chance of the upper part breaking in a storm. The real reason to stake is to hold the roots steady so that the tree can quickly send out new roots and attach itself into the ground. If the roots move around after planting, the delicate new ones that grow out will not be able to anchor themselves in the soil, so your tree will be slow to establish and could die before it does. This is mostly a problem when planting bare-root trees, since there is no root-ball to give weight and anchor the tree in the ground. So bare-root trees should definitely be staked when being planted. For other trees, when you are putting back the soil, make sure you firm it down well with your feet. After you have finished planting, take hold of the trunk half way up and gently rock the tree. If you can’t see any movement at ground level, you don’t need to stake your tree at all. The natural movement of the stem will stimulate the tree to grow a thicker trunk and hold itself up. Trees are not known for their brains, so if you stake a tree so the trunk cannot move, the tree will ‘think’ it has a strong trunk and send out lots of new shoots at the top. If you then remove the stake, as you must eventually, the trunk will be too weak to hold the top and it could easily break. The longer you leave the stake attached, the more likely this is to happen. If there is some movement at ground level, or you are planting a bare-root tree, then staking is necessary. If planting in a very windy location, staking can help prevent loosening of the roots after planting. Remember, we only want to hold the roots steady, so you don’t need a tall stake. Take hold of the stem low down and move your hand up until the top of the tree is straight. That is the place where you need to attach the tie – don’t worry, it may only be a foot above the ground. Take two strong wooden stakes. Allow at least 18 inches to go into the ground and about six inches above where you are going to place the tie. Drive the stakes into the ground outside the root-ball, one on either side of the tree. If you have a strong prevailing wind, put the stakes in the same direction as the wind blows. Use broad reinforced rubber belting, not rope, to secure the tree and it should have some stretch in it. Attach the belting to one post with nails; then pass it behind the tree and around the other post. While pulling it tight make a double twist around the strap, pass it in front of the tree and make another double twist before attaching it back to the first post with more nails. The tree should be able to move slightly and the strap should not be twisted around the trunk. Remove the belting at the beginning of the tree’s second growing season. The stakes can be left in as a reminder to keep mowers and trimmers away from the trunk. Never use a string trimming close to a tree trunk, as it can damage the bark and cause permanent serious injury to a young tree. So we have gone past all the old tree straps, rope, wire, hose-pipe and other systems that held trees rigidly against a heavy post. Now we allow the tree some movement and an opportunity to grow naturally, with just a gentle helping hand from us. I have a mature white dogwood about 35-40 years old that sustained wind and water damage last week in Hurricane Matthew. At the end , it has about a guesstimate of about 20-25degree tilt on one side with the ground raised on the opposite side w/o roots exposed. I hate to lose it, is there any hope in saving it and how? I really love it and will miss it! If you can’t say how, do you know of a source? This should not be hard to fix, and I don’t think you will lose the tree. You say the roots are not exposed, so that is a good thing. What you need to do is this. First, loosen the soil in the lifted area, and dig out some soil between the roots. Now, if your tree has a strong central trunk, wrap the upper part of the trunk – just below where the branches come out, in several thickness of sheet foam, bubble wrap, or pieces of styrofoam – anything that will protect the bark from pressure. Tie a strong rope around the trunk. If there are several trunks coming from low down on the tree you will need to do this for the two or three main ones. Now find a group of strong men – or a pickup with a careful driver, and pull the tree into an upright position. Secure the rope (or put the brake on the truck) to hold the tree in place. You may need to do this gradually, removing soil and pushing down the roots as you go. Once the tree is upright, put back all the soil, pushing the roots as deep as you can and firming the soil as you go. Finally, again using something soft to protect the bark, attach two ropes or wires to the trunk, set at an angle of about 90 degrees to each other, and attach them to two long stakes driven at an angle away from the tree into the ground. You might need to put wire strainers on the wires to get them nice and tight. Remove the rope you used to pull the tree upright and you should be all set. Leave these lines in place for two years, then remove them and everything should be back to normal. Oh, one more thing, don’t tie the final wires tight around the bark, or you may damage it during the two years they are attached. One way is to thread that section through a piece of old hosepipe to protect the bark and give the wire a grip at the same time. I have a 2 year old 5ft Lilac Korean Dwarf tree with a very unusually thin trunk. It is exposed to an open area that receives extreme wind gusts. It is top heavy with a beautiful crown of foliage which causes extreme bending during heavy wind gusts. I know it will snap sooner or later under 30-40 mph wind gusts. I understand your article against tie downs, so my thought is to place a small rubber tube around the upper base branch, just under the crown, to prevent the tube from slipping down….However, leave enough slack to allow movement and root stability…so, once the storm gusts happen, the slack will tighten as the tree starts to bend heavily. (Like having a dog on a leash that tightens when the dog suddenly sees a squirrel) Your thoughts? These standard trees are a bit of a special case, and can need permanent staking. They are artificial, in that the top has been grafted onto a stem, not grown up naturally, so the graft-union is a persistent weak point. Even old plants can snap in a storm. For these trees, the points about building the trunk don’t necessarily apply, and sometimes the best approach is a sturdy, permanent stake going up into the crown, securely tied. If the grower didn’t choose the variety for the stem carefully, it may never thicken enough. There is nothing wrong with your tree in using a permanent stake – perhaps one of those square wooden ones. Just check the ties once a year to make sure they don’t cut into the wood as the stem and branches thicken. If your tree is exposed to strong winds, as you say, then I think a permanent strong stake is the safest. Just make sure it goes up into the crown, and is attached up there at least once, not just on the trunk. Enjoy your tree.